Mute Soundproofing® were commissioned to design and build a ‘Room Within A Room’ system, creating a home recording studio, for two existing, domestic outbuildings, to form a ‘Live Room’ and ‘Control Room’, with a performance criteria of > R’w55dB. The system included twin, acoustic door-sets, connecting the Live Room to the adjoining Studio Room and the Studio Room to the adjoining domestic dwelling-space. Primary and secondary glazed, sliding acoustic doors, connecting both rooms to an internal courtyard, were also integrated, as were acoustic power-points and a sound attenuating, air-ventilation system. 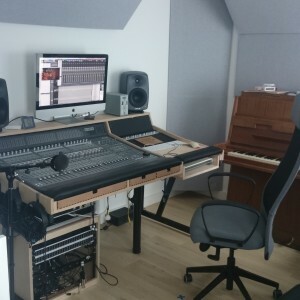 On completion of the ‘Room Within A Room’ system, the interior acoustics were diagnosed and treated, employing wall and ceiling-mounted absorbers, to achieve the correct tonal balance, required for professional quality home recording studio productions. This entry was posted on Saturday, August 8th, 2015 at 2:22 pm	and is filed under Soundproofing News. You can follow any responses to this entry through the RSS 2.0 feed. Both comments and pings are currently closed.